Christmas is celebrated in the United States on the 25th of December. Christmas is a civil holiday and is celebrated by an increasing number of non-Christians, and is an integral part of the holiday season. 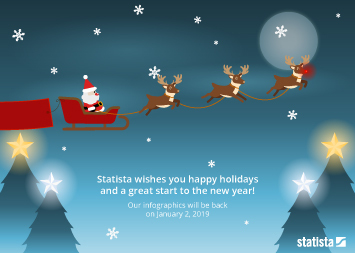 According to a Statista survey carried out in 2016, the vast majority of respondents stated their intention to celebrate the holiday, with only 5 percent declaring that they would not be joining in with the festivities. Christmas is typically the largest economic stimulus for many nations around the world as sales increase dramatically in almost all retail areas. The United States' retail industry generated over three trillion U.S. dollars during the holidays in 2013. These holiday sales reflected about 19.2 percent of the retail industries total sales that year. As a result, just over 768 thousand employees were hired throughout the United States to compensate for the holiday rush. The Christmas shopping season can start as early as September and some consumers begin even earlier. The Christmas tree is considered to be the main symbol of this pagan tradition, and is an integral part of the holiday shopping season. About 26 million real Christmas trees were purchased in the United States and cost, on average, about 50.82 U.S. dollars in 2015. However, a survey in 2016 revealed that only 34 percent of 45 to 64 year olds were planning to buy a christmas tree for the 2016 holiday season. The economic impact of Christmas is a factor that has grown steadily throughout the United States and the world and will continue to be a significant event and key sales period for retailers and businesses. This can be evidenced in the fact that 29 percent of respondents in a 2016 survey stated that they expect to spend over 500 U.S. dollars on gifts for the holiday season. Retail industry sales in the U.S.
Christmas shopping in the U.S.
More interesting topics from the industry "Fashion & Accessories"